A week of imagination and inspiration...Style Fashion Week NYC! New York City Style Fashion Week is where the imaginative pour their souls into the creation of designer collections to present on our prestigious runways. As the Art & Design Director for www.stylefashionweek.com I count the days for the week to come! I help produce the fashion week events in each market, including NYC, Los Angeles, Palm Springs, Miami, Dubai, The Hastens, The Bahamas, Cuba, Mexico, Europe and the list goes on and on. 5 interior design trends you need to try on 2017! I am so thrilled to bring my love of art, fashion and interiors together as Art & Design Director of Style Fashion Week Global! Look for great things at all the Style Fashion Week events around the world! Make sure to follow me on Instagram @kenngrayhome for the latest updates and to follow me du by the process of creating magic! I love being a part of such a visionary publication! So much inspiration comes from flipping through the pages of Luxe Magazine! What inspires you? Thank you www.amara.com for asking me to contribute to this great article! Read it here! Places you go can mean a lot of different things depending on your intention. My trip to London to attend the interior design blog awards gala was nothing less than inspiring. I arrived feeling trepidacious about the experience but left feeling a longing to stay. London was more than I ever dreamed it would be. Being nominated for this prestigious award and attending as a top 5 finalist out of over 700 of my peers was almost more than I could have imagined. A true testimony to working hard and having a clear vision of intent. A lot happened during my trip but mostly I gained an appreciation for the immense history and grandiure nature that London embodies. A true experience at the highest level. The people. The visual eye candy. The whole thing. Perfect. Do yourself a favor and travel to london. As often and as much as you can. Embrace the culture as I did and change your view. Thank you to everyone who made my experience one of the best of my life. Style Fashion Week in Palm Springs coming up soon and I have a surprise! I am so excited to announce that I will be curating the art marketplace for Style Fashion Week here in Palm Spings on November 9-13! This will be an exceptional opportunity to see and buy from some of the valleys most sought after artists! AND a portion will go to charity!!! What is better than that?!? I will be Listing all of the artists soon but let me tell you, it is a long and impressive list! i love he idea of a creative fusion between art and fashion. You have heard me talk about that a lot and now it will be right in front of you at this fashion week! Get your tickets www.bit.ly.com/SwingSFW and use code SWINGPOINT for a discount! Wow! What a great email to wake to! Out of 750 blogs nominated and over 40,000 votes cast, this is the email I woke up to this morning! Amazing! Fashion and Fabulous on Hollywood! 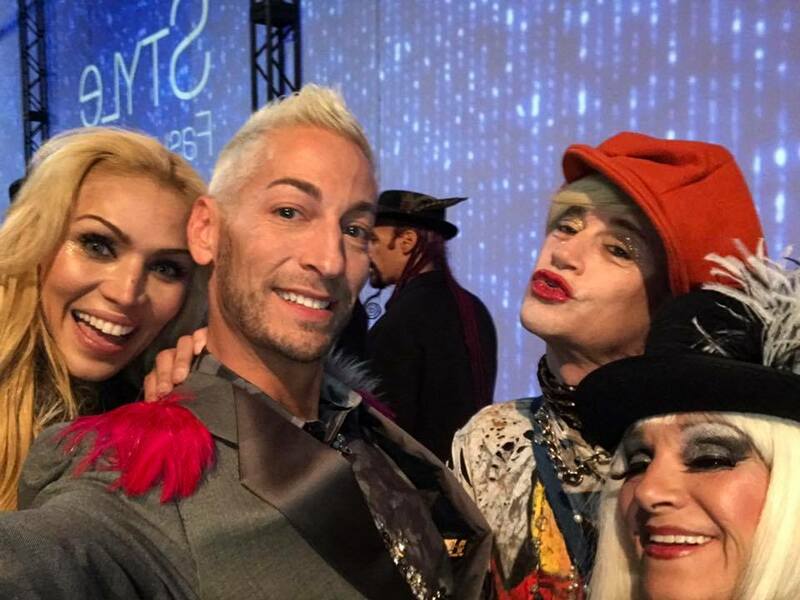 Fashion and fabulous collide in Hollywood last night at Americas Next Top Model, Ava Capra's birthday event at The Argyle. Kennn Dolls unite! Rob Grace was there donning a very industrious fox while acclaimed model and influencer, Brandon Cole Bailey shared the spotlight with bestie Ava Capra and long time friend Kenn Gray. 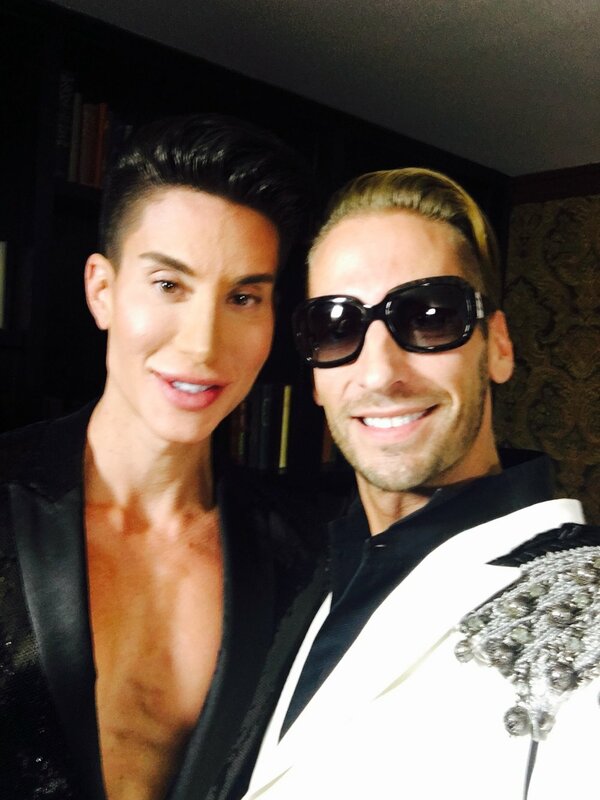 Justin Jedlica, the human Kenn Doll makes as effervescent an appearance as usual with Kenn Gray. Interviews and good times were had by all! The kids of Hollywood know how to throw down and Kenn Gray, being no stranger to the red carpet, was no exception! He spoke about his new show, 'The Gray Area', which is in pre-production, as well as the fashion looks of the night. Don't forget to vote! Only a few days left! copy and paste the link below into your browser to vote! Sitting here by my pool in Palm Springs California, looking at these majestic mountains, tends to start my day perfectly...with inspiration and gratitude. I have always been inspired by nature and the desert landscape certainly has been an invigorating call to action! Many of my new clients are not sure how they can create their living spaces to be aligned with either the architecture of their home or even what is outside. I often try to bring the outside in. Using stone or other natural resources and neutral colour palettes is one way to do this. Being creative isn't a gift, it's only a matter of looking and thinking. Designing your life starts with you. Then it ends with a perfect melding of all the wonder around you. I am so honored to be nominated for the Interior Desogn Blog Awards! Please go to www.interiorblogawards.com/vote/Kenn-gray-home/ and VOTE! Also, please share to your Facebook page! I promise a wonderful blog series coming to you about everything design as this all unfolds! Thanks so much! Hanging artwork baffles many people. How high should a picture be hung on the wall, what color should the matting be, and how can you decide what goes where? In general, artwork should be hung so that the center point of the picture or grouping is at about eye level for the average person. While this won't be possible in every situation, it's a good guideline to keep in mind. Another technique to remember is that a grouping of pictures should be thought of as one unit. Test an arrangement of pictures by laying everything out on a large table (or on the floor), playing with combinations until you hit upon one that works. Laying them out on paper is even better since you'll be able to trace around each object and determine where picture hangers should be installed. Tape the paper up on the wall as a template for picture hangers and you'll be done in no time. You can also lay out pieces of scrap molding (or tape) onto the floor to form the "outside" boundaries of a picture grouping -- the measurements within which the smaller pieces of art will be set. This is useful when a particular wall has certain boundaries that must be observed (such as a chair rail, windows, heating vents, and the like) and helps keep your arrangement the proper size. Evaluate the artwork in your own home. You may find ways to accomplish an "art makeover" to better showcase your artwork. These are some tips that might help get the process started…or at least inspire you! Choose smaller pictures for narrow walls and larger works for big wall spaces. In general, when choosing art for over a piece of furniture it should not be longer than the width of the furniture. Illuminating artwork gives it importance. A well-lit piece of artwork gives the room a designed feel and offers additional indirect lighting to the space. Vibrant colors bring excitement to a room while neutral colors are more calming. Color can be added with selecting the perfect matting option that correlates with the room color. One large painting makes a statement and keeps things simple. It can also call attention to a focal point in the room such as a fireplace or a bed. Strong horizontal lines in artwork, or in the way artwork is framed or hung, tend to be calming and can give the illusion of width in a narrow room. Strong vertical lines – in a picture, in a frame, or in the arrangement on the wall – add to the feeling of height in a room. This can also add to the drama of a space. Symmetry adds balance and formality to an arrangement and is generally pleasing and calming to the observer. Do something unexpected by hanging pictures in an asymmetrical arrangement. Two horizontally framed pictures can easily be hung with two vertically framed pictures by offsetting each style. A group of pictures framed alike and hung together can have big impact. Use this random technique for hanging a collection in a contemporary space. In your own home you might also consider more traditional collections of items such as movie posters, Ansel Adams prints, or Georgia O'Keefe florals. Pictures will have greater impact if matted in a contrasting color to the wall. Choose a dark mat for a light wall and vice versa. Hopefully you found these tips to be of help, but, as always, if you get stuck, or just need some help, I am only a phone call away! Accessorizing…toooo much or not enough? Everyone enjoys having home décor accessories to help enhance the overall look of a room but not everyone knows how to arrange them correctly. This is actually a big problem for many people. When it's done incorrectly it takes away from the décor instead of adding to it. One of the most important things that you need to learn about home décor accessories is how to arrange them properly. You need to start by finding a balance. In other words, you don't want your accessories to be dull and boring but you don't want to over-do-it either. Having too many things in one place can make the area appear cluttered and messy, which is probably not the statement you're trying to make. Size is also important. The items need to be in proportion with the size of the area where they will be displayed. Arrange your accessories with harmony and contrast in mind. Harmony is placing items together that have something in common such as their color or style. Contrast is just the opposite. It is created by placing things that are different together such as, rough items being placed beside of something that's smooth. Every arrangement of accessories should have both harmony and contrast to give off the perfect balance and create the effect you're trying to achieve. In order to receive the maximum effect, you need to layer your objects. It's recommended that you have a defining piece. This item needs to be taller and larger than some of the others in the arrangement and it should be placed a little off center. The back layer should be taller than the defining piece, followed by a middle layer of medium size objects and finished off with the smallest items up front. This type of arrangement keeps the eye moving and the accessories interesting. There are so many choices in today’s market in terms of accessories also. Just be sure to choose wisely. Making a statement can sometimes be done in a simple way. And as always, you can always give me a call and I will come help you! Kenn Gray at Palm Springs fashion week. Opening night of FWEP was a blast! Amazing showing of Monique Lhuillier and ridiculous and the fashion scene with glamorous guests from all over the Coachella valley and beyond. I sported Mister Triple X bunny ears and wood grain jeans with a comme des garçons jacket that melted the hearts of many. Fashion show benefitting the humane society was pretty ruff. lol. Really, with an 80's theme, it was so fun! Michael Jackson and Madonna impersonators and perfect pooches walked the runway to raise money to save em all! I wore faux fur so as not to be rude. Lol. Also sported the brand new Chanel sunglasses and enjoyed meeting some of the divas of fashion week! Earlier in the afternoon I spent time at the polo fields which was a new experience. I gotta tell ya...I almost had a Julia Roberts moment! Awesome time with amazing new friends! Lovin this week in Palm Springs! @palmspringslifemagazine has put on an amazing fashion week so far! Can't wait for the rest of the shows! Meeting the coolest peeps too! 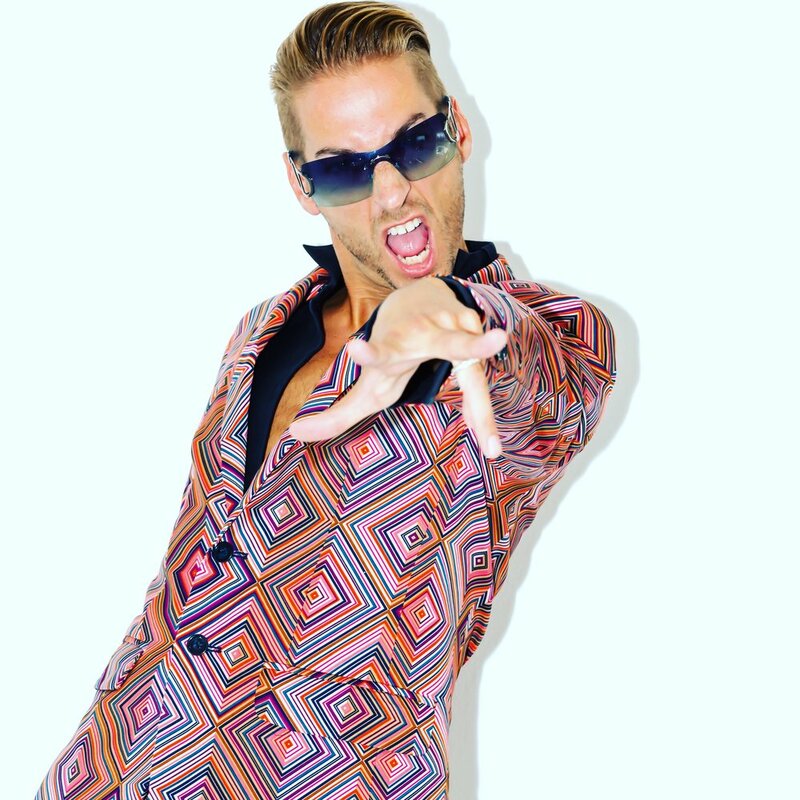 #killinit @chanelofficial sunglasses and @donaldjpliner orange shoes are makin an entrance! I forgot to give a shoutout to @dior for these tight shades! #fashion #eyewear #polo and @brackishbowties for the sweet feather bow tie! I love taking a challenge like this and giving the clients exactly what they want. The couple provided me with photos that they had saved of things they liked and we worked closely to achieve what I believe to be a stellar transformation that they will enjoy for years to come!